2017 Taxes: $2,849.00 | 1,780 Sq. 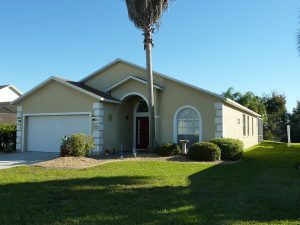 Ft.
Disney Vacation Home For Sale – Location, Location, Location! Lovely 4 bed/3 bath home with stunning water view in the popular community of Bridgewater Crossing. New roof November 2018! New A/C 2017! Fully furnished and equipped this home is a hidden gem and move in ready. The open floorplan offers spacious accommodation comprising; fully tiled great room, dining area and well equipped kitchen; 2 master suites, two twin guest rooms along with a third bathroom. Enjoy the beautiful view from your extended pool deck and lanai – Florida living doesn’t get much better than this! This home is perfect as a short-term vacation rental, a second home or a primary residence as this peaceful community offers lots of amenities: tennis, volleyball, basketball courts, a playground, a lovely community pool and walking paths and sits within minutes of I-4, Hwy 27, Old Lake Wilson Road & Hwy 192 – great for the commute or giving alternative routes to the attractions. 2 miles to Championsgate, 6 miles to Posner Park shopping area and restaurants. Call to arrange a viewing today – you won’t be disappointed …..